Aoife Ralph, along with 100-year-old Annie MacPherson. 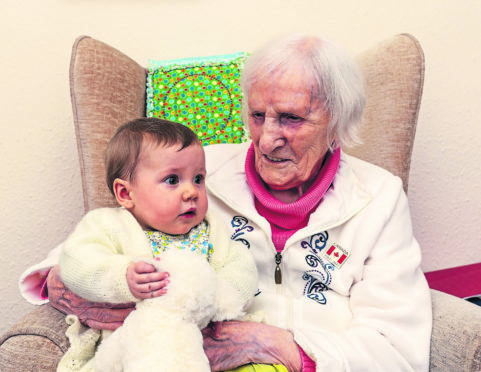 There was a historic meeting in Burghead at the weekend, when a woman and a baby who were born in the same house 100 years apart met for the first time. Little Aoife Ralph was born at home at 21 Brander Street in the village on May 9. That was almost 100 years to the day since Annie MacPherson was born in the exact same location, one of nine siblings who were all born in the same house. The two met for the first time on Friday night at the Burning of the Clavie celebration, an event Mrs MacPherson attends every year. Aoife’s mum Oonagh Brady was thrilled to be able to witness such a “special” moment between two different generations of Burghead folk. She said: “It was a really lovely moment, I hadn’t met Annie before, but I had heard about her. “It was a touching experience and quite special to be a part of it as never mind them being born in the same house, it was the fact she was 100 years old and holding a baby that made it special. Oonagh is originally from the Galway area of Ireland, but has been living in Burghead for nine years and her husband is friends with Mrs MacPherson’s family. She had always planned on meeting the centenarian, who was born on May 5, 1908, but the timing had never been right until Mrs MacPherson made her annual trip to Burghead to see the spectacular ceremony last weekend. The 100-year-old is a lifelong Brocher and only left Burghead when she moved to Anderson’s Care Home in Elgin about two years ago. However, she still makes the effort to attend the Burning of the Clavie every year and was at the house she was married in across the road from the Brady residence when she got a very special visitor. Mrs Brady joked that everyone was hoping for her to give birth on Mrs MacPherson’s birthday.